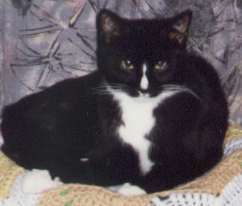 Princess was a feral cat adopted by Shawn in 1992. Shawn's fianc�e Kathleen writes, "Princess was more than shy when we first met. She would never venture onto the couch like other cats, she would run out of the room if anyone stood up.. she was just so skittish! However, after living in a loving home for eight years, she has had a change of attitude! Princess now hops in to your lap, rolls over for belly rubs and is constantly snuggling. I just wanted to say thank you to Kitty Angels for saving Princess and hundreds of other cats." 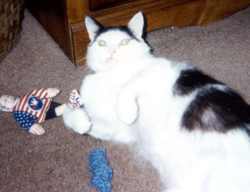 Chip is an FIV-positive cat adopted by James, who sent us this picture of Chip playing with his pal, "Bill Clinton." James writes, "Sometimes I call him PITA (Pain In The A**), and he's a glutton, but I love him anyway." Normally, you'd think that the cat on the right is the KA alumnus, but no - it's the dog on the left! 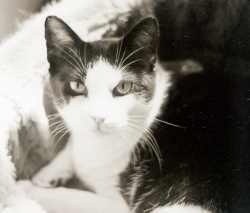 Bob and Vicki write, "The day we adopted Winston, our cat, from the Upper Valley Humane Society, I (Vicki) went to PETsMART to buy cat food and litter. This is where I met Patrick, a cocker spaniel that Kitty Angels had just rescued. Yes, I know Kitty Angels only rescues cats, but this was an unusual rescue. With guidance from Kitty Angels and the Upper Valley Humane Society, we introduced both animals into their new home. As you can see from the picture, they have adjusted very well to their new environment. Five year old Patrick and six year old Winston were adopted August, 1999." 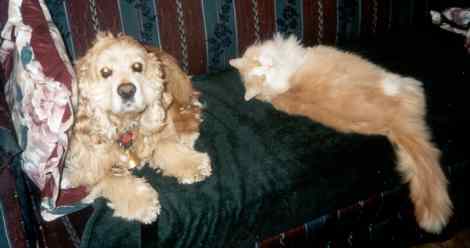 Kelly writes, "During the last week of February 2000, I visited a PETsMART store in Nashua, New Hampshire. During my visit I looked upon the cats that were up for adoption. It completely touched my heart to see them there. I felt for each and every one of them. So much so, that when I left I literally cried for them. I was so moved. There was one little kitty in particular that I felt a connection to-little Budweiser. He was so small, so helpless looking, and he had little crossed eyes. I started playing with him through the cage, and I was hooked. I left that store and thought that I could make a difference in this cat's life. "I came back and visited that store several times in the next few days, and finally I decided that I had to adopt this cat and give him a chance in life. I already had two cats, but I knew that I had to have Budweiser. So, I went back and talked to the volunteers and they told me about him. He was a wild cat who was found in a squirrel trap at around 12 weeks of age. He was very shy and didn't like to be handled at all. "So much has changed I am glad to report. It was a a big adjustment to make for him, but I am happy to say that Budweiser is doing wonderfully. He is the huggiest little kitty I have ever seen. Aggressively friendly I might even say. He loves my other two cats and he loves his hugging sessions with me. He is a little nervous around new people, but he has been so rewarding. When I adopted him I was told that he may never like to be held or touched like other cats, but Budweiser has developed tremendously in the time I've had him. I am so glad that I made the decision I did only three months ago. It has been so rewarding knowing that I made a difference in this cats life. Kitty Angels is such a worthwhile organization. I only hope that everyone feels this wonderful about their adoption, and I wish that everyone out there knew that adopting a cat can be such a fulfilling act. You save a life and you also reap the benefits of having that life to hold and to play with."